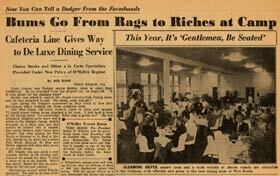 A headline in The Sporting News in 1951 pronounced, “Bums Go From Rags to Riches at Camp,” as Dodgertown was upgraded under the leadership of O’Malley.Ibid. On March 18, 1951, Vero Beach residents rejoiced over the dedication of the new $800,000 Merrill Barber Bridge, spanning the Indian River. O’Malley, though, did not like waiting until next year at any time. Not when he could get something done in the current year. While the search continued for a new home in Brooklyn to remedy Ebbets Field, which opened in 1913, the idea of building a new spring training home stadium very much appealed to O’Malley. Previously, the Dodgers had to split time in Vero Beach and in Miami, about three hours south. O’Malley was going to use Vero Beach not only as a training ground for ballplayers, but for one of his fine architects. O’Malley’s idea was to use the ballpark as a sort of tryout for Capt. Praeger to design a stadium with unobstructed field views at reasonable costs. Of course, O’Malley had a much grander plan for Brooklyn in mind — a 50,000-seat domed stadium — but the Vero Beach job was just as important to him on a smaller scale. He would learn more about the process of building his own stadium, the pitfalls, the expenses (both known and unforeseen) and the timeline for construction. 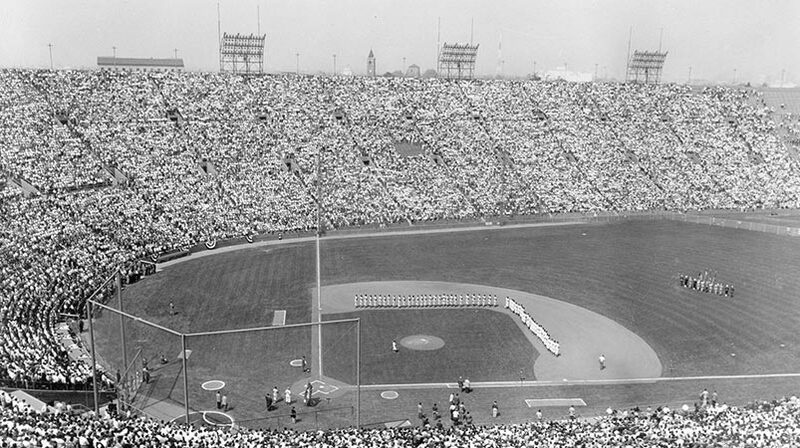 The type of construction first implemented at Dodgertown would be a precursor to that used by O’Malley years later in Los Angeles. As a fan of the nice, quiet Vero Beach community, O’Malley believed that a long-term relationship with the city would be just right. In fact, it was an area where distractions were kept to an absolute minimum and that suited O’Malley and staff perfectly. If they were fortunate, the players were entertained by walking from the base to the city’s only movie theatre downtown and back. But, he did not want the transient Dodgers to cause any trouble for the community in the two months of training camp. 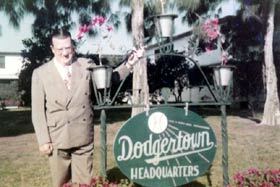 Walter O’Malley stands in front of the Dodgertown complex. His on-going desire to make improvements to the spring training site raised baseball’s standard to a new level. A 1951 headline in The Sporting News shows Dodger President O’Malley’s immediate impact on Dodgertown. 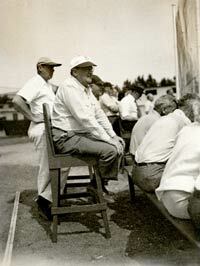 A fan of the game, Walter O’Malley sits behind home plate and observes the activities.